If a man wants to know for certain the road he is on he has to keep his eyes closed and walk in darkness. ^^'The dark night of the soul' has come to typify that condition of spiritual dryness, depression and seeming abandonment by God that many Christians experience at some stage in their lives. In The Dark Night of the Soul, St John, a sixteenth-century Spanish mystic and poet, describes the spiritual road that leads to union with God. On this road the soul must enter the Dark Night to be stripped of its imperfections, including the famous 'seven deadly sins' - a process that often takes a number of years. ^^This new edition of a great spiritual classic is for all who long to find God in the middle of their darkest times. It includes an introduction from the translator and a new foreword. 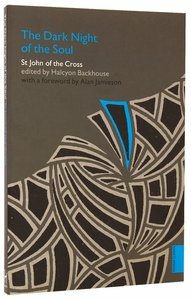 About "The Dark Night of the Soul (Hodder Classic Series)"
St. John of the Cross represents the pinnacle of Spanish mysticism. In contrast to St. Teresa's works, which refer frequently to things of this world, St. John's poetry works on a purely spiritual, abstract plane. His poems consist of allegorical descriptions of the journey of his spirit through mortification of earthly appetites, illumination, and purification of the soul to union with God. In his prose commentaries on his own poems he laments the insufficiency of language to communicate his mystical experiences and his interior life. A disciple of St. Teresa, he became the spiritual director of her convent at Avila in 1572 and was responsible for carrying out many of her rigorous new programs for the Carmelite Order. Objections to his extreme reforms led to a period of imprisonment and torture in Toledo. During this time, according to tradition, he wrote Spiritual Canticle. His concentrated symbolic poetry has been studied with enthusiasm by such modern poets as T. S. Eliot, Paul Valery, and Jorge Guillen.